My delicious warm wild rice salad with sausages and apples is the perfect recipe all year round. I developed the recipe one day a few years ago when I had a a few too many apples in my fridge. 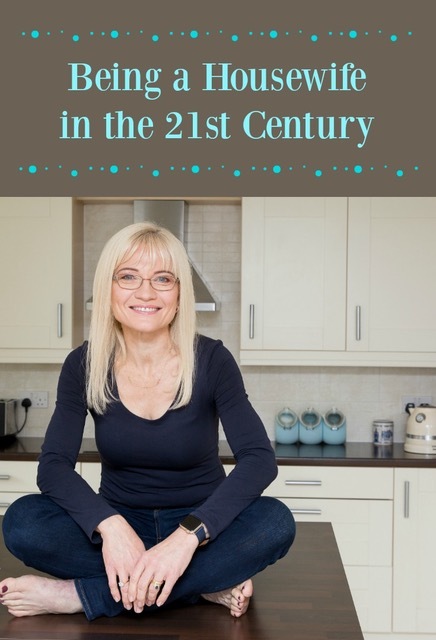 I’ve made it many times since and it always goes down well, whether for an easy weeknight supper or a more elaborate dinner party. The best part is, it takes only about 40 minutes to prepare and it really is very easy to make. I first published this recipe back in 2011, and it’s still a family favourite. You can switch the flavours in this recipe up by using different kinds of sausages. My favourites are the Caramelised Onion sausages from my local butchers. It’s also fun to use pork and apple sausages to for an extra apple-y dish. Don’t peel the apples; the skin adds a lovely colour. I often use a mix of red-skinned and green-skinned apples for that very reason. Originally I just used ordinary cider vinegar in my warm wild rice salad with sausages and apples but on several occasions I have also used a wonderful Cumbrian Damson Cider Vinegar with local honey. In a pinch, you can also use white wine vinegar, although I do like how cider vinegar echoes the flavours of the apples. Warm Wild Rice Salad with Sausages and Apples is especially delicious accompanied by a nice glass of red wine. Preheat the oven to 375°F (190°C or 180°C for fan ovens). Bake the sausages in a roasting pan for about 20 to 25 minutes, turning once, until no pink remains inside. Remove from the oven and keep warm. Meanwhile, cook the rice in boiling salted water in a large saucepan, according to package directions. When cooked, drain and keep warm. Heat the 1 teaspoon of oil in the frying pan over medium heat. Sauté the onion until it begins to soften. Sprinkle with a bit of salt to keep it from browning too much. Grate in the garlic and then add the chopped apples to the pan. Stir fry for a minute or two. Taking care not to burn yourself, cut each of the sausages in 3 or 4 pieces and add to the pan. Mix the 2 tablespoons oil, the vinegar, mustard and honey together to make a vinaigrette. Pour the vinaigrette into the pan with the sausages and apples and stir to coat. Allow everything to sizzle together for a minute, stirring constantly. The apples should be slightly softened but still have a bit of bite to them. Divide the rice between the plates and serve the sausage and apple on top. Preheat the oven to 375°F (190°C or 180°C for a fan oven). Meanwhile, cook the rice in a large saucepan in boiling salted water according to package directions. When cooked, drain and keep warm. Heat the 1 teaspoon of oil in a frying pan over medium heat. Sauté the onion until it begins to soften. Sprinkle with salt to prevent it from browning too much. Mix the 2 tablespoons oil, the vinegar, mustard and honey together. Divide the rice between plates and serve the sausage and apple on top. Apples are great in savory dishes too, April. Mustard, cider vinegar and apples – love the combo of flavors. Sounds so tasty! Apples and pork are a natural blend. The rice adds another layer of taste and texture. Add the honey & mustard…LOVELY! Thanks. Thank you, Emma 🙂 I’m always looking for ways to avoid mash too! What a great frugal recipe. Thanks for a new idea for a cheap and delish dinner! A hearty dish perfect for the fall and a quick mid-week meal! Thank you, Jacquee. It’s really good for mid-week entertaining too! Caramelized onion with the apples & sausage sound Fall season delish. The wild rice addition really tops it off. Nice. I love the addition of apples, great for autumn season! This looks great! Apples are abundant now so this would be a great time to take advantage of this recipe! Oh I love the combination of sausage and the sweetness of the apples! This rice sounds delicious! And very fall-ish, which I love! This recipe is one that I think my family would love. We have 5 apple trees, so I am always looking for great ways to use them. Delicious, April, love sweetness of apples in this rice salad. Thank you, Swathi! It really does have a wonderful flavour. Yum! I love the texture of wild rice so much more than regular rice. I’m not sure why. This looks delicious! 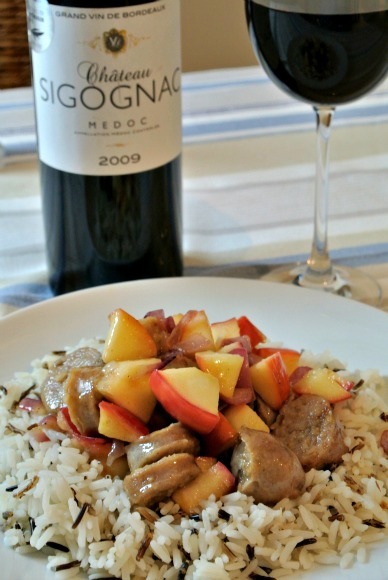 I love the flavor of apples and sausages together – add some warm rice and that is comfort food at it’s best. I’ll bet this makes for some great leftovers! 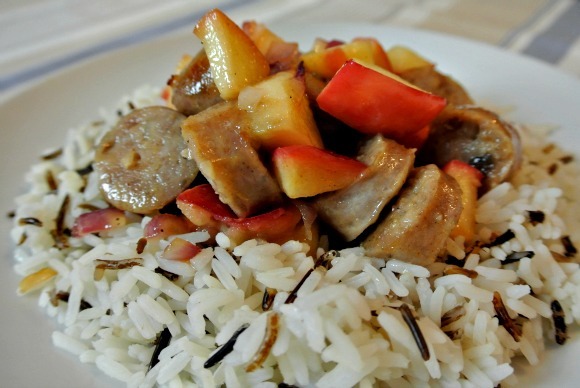 Ooh, I’ve seen apples with sausages before, but serving it with rice is really interesting! Sounds yummy, and I bet it would work great with vegetarian sausages too. What a warm and cozy meal, the combo of sausage and apple sounds sooooo good! What a lovely autumn meal April and I love that is light yet satisfying. This is a delicious recipe to add to my Thanksgiving Menu. It’s one of my fall favorites.